As essential to the display as the fireworks themselves, these small wand shaped safety lighters have been around for some time. With an average burn time of around four and a half minutes, these safety lighters are designed to be windproof ensuing that your firework will light the first time and giving you an extra six inches reach to the fuse. Today we were asked about why they are known by this name. Not something I had ever thought about before so we thought we would look into it. It transpires that it should be pronounced Porte-feu as it was a French invention from the early 16th century used primarily for lighting cannons, explosives in the mining industry and of course rockets used as a weapons in sea battles. The words Porte (to carry) and feu (fire) when combined give us the name. The term was translated into English as ‘Portfire’ around the seventeenth century. Portfires are simply long tubes crammed full of slow burning gunpowder with a fuse, when lit a steady flame appears allowing you to light the fireworks in a safe way. With safety remaining top of our list of priorities, all display packs in the Epic range are supplied with these lighters but we recommend them to all our customers. 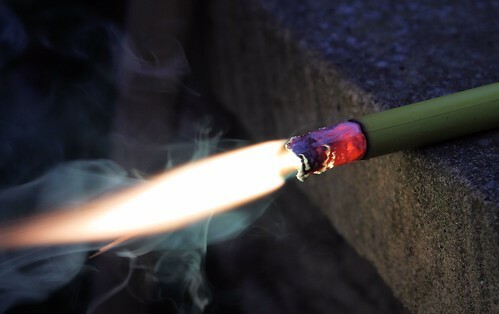 You could of course use a plumbers or cooks blow torch, but at just 96p for four our portfires may work out less expensive and are designed specifically for lighting fireworks. Portfires are also ideal for lighting multiple sparklers at the same time like at a wedding with a guard of honour in sparklers or when launching Chinese lanterns as the wax fuel cell that creates the heat and therefore lift is quickly and easily lit.